What did it feel like inside GM's truck group when gas prices shot up over $4 a gallon last year? Automotive engineer Keith Seymore summed it up in this short quote: "In a six-month period, everything went upside down." 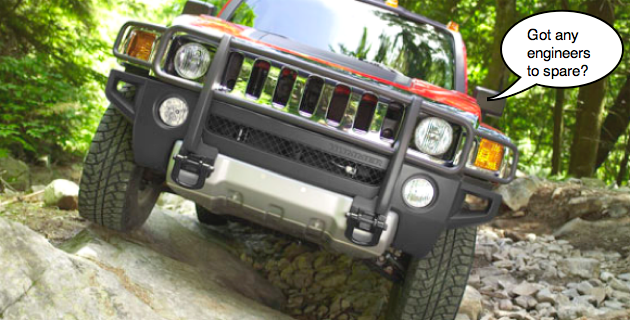 While in the truck group, Seymore had been tasked with working on the Hummer H2 but, when GM announce that Hummer would be sold in March 2009, his 29-year career looked in doubt. Heck, GM's entire existence at that time looked pretty shaky. The Chevy Volt stepped in to save both the company and the man's job. When Seymore was asked to join the Volt team, he was hesitant, but was told that the plug-in hybrid was "going to save the corporation." Seymore's job was saved, too, but only with a pay cut and a drop in benefits. Still, he's happy to be working on GM's "moon shot" car and says, "It's a blast working on such a visible project." From Hummer to the Volt, one engineer's tale originally appeared on Autoblog Green on Tue, 15 Dec 2009 14:02:00 EST. Please see our terms for use of feeds. 0 comments on "From Hummer to the Volt, one engineer's tale"